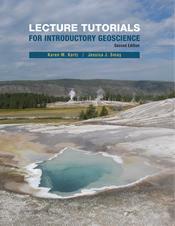 A set of brief worksheets designed to be completed by students working alone or in groups, Lecture Tutorials in Introductory Geoscience engage students in the learning process and make abstract concepts real. Through the use of effective questioning, step-by-step learning, and a progression of simple-to-complex visuals, Lecture Tutorials help students construct correct scientific ideas about often-difficult topics, while dispelling common misconceptions. Research based on extensive classroom use shows that Lecture Tutorials increase student learning more than just a lecture alone.